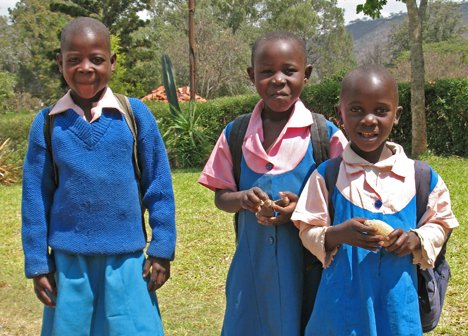 Children attend school at the Old Mutare Mission operated by The United Methodist Church in Zimbabwe. The country's economic crisis is causing severe hardships at the mission, which includes a hospital, children's home and church. UMNS photos by Kami Rice. The sewage system is overloaded, buildings are decaying, electricity is unreliable, and economic turmoil in Zimbabwe make operating two schools, a hospital, a children’s home and church nearly impossible. Yet Old Mutare Mission, a ministry of The United Methodist Church for 110 years, is determined to continue its ministry to the people of Zimbabwe, its leaders say. "Our sewage system is so overloaded that ZINWA (Zimbabwe National Water Authority) is now giving a fine to the mission every quarter," said the Rev. Solomon Mudonhi, mission chairman. "We are trying to do what we can, but it’s challenging in the current economic situation." "Once we touch the ground, we will bounce back," says the Rev. Solomon Mudonhi, chairman of the mission station. Located down the road from United Methodist-related Africa University, the mission is supported primarily by student fees from its 1,000-student primary school and 1,050-student high school. However, the school fees are now set by the Zimbabwe government, so the mission is no longer able to charge realistic amounts to satisfy its budget. The schools operate farms that provide milk, eggs, vegetables and pork, but other commodities are scarce and expensive. The school has broken ground for homes for additional teachers, but the buildings can’t progress because the school can’t get cement. Electricity is also undependable, making it difficult for boarding students to study at night. Five former students donated a generator to help, but it’s difficult to get fuel to power it. Although the schools are run by The United Methodist Church, all of the teachers are civil servants paid by the government. Salaries have not kept pace with prices. For example, the government housing allowance is Z$800,000 per month, but a decent accommodation in Mutare costs Z$20 million each month––more than a teacher’s annual salary. Teachers and staff members are basically donating their services and must supplement their salaries. One teacher makes cakes to sell during the staff tea time. Other teachers are resigning and moving to places like South Africa where the pay is better and the economy is more stable. In spite of the difficulties, school staff members are friendly and kind to visitors. School children smile and play. "Zimbabweans are very prayerful," said Mudonhi. "They are Christians so it appears they get their perseverance from God. If this had happened somewhere else, there would have been riots and war." While the needs for health services are great, many people served by the Old Mutare Hospital are either unemployed or low-paid farm workers. "We are not able to charge fees that are high and help offset our expenses," said Mudonhi. "Some patients aren’t able to pay at all, but the hospital won’t deny them treatment." Mission buildings show signs of decay, and there is no money for repairs. The number of patients treated in the 70-bed hospital’s four sections—a dental clinic, outpatient and inpatient treatment, a maternity ward and a voluntary counseling and testing unit––continues to grow, so the hospital needs more nurses and personnel. It now has one doctor and 12 nurses, 25 nurse aids and 10 support staff. In order to attract more nurses, the hospital needs to build more housing, which it’s unable to afford now. Nurses have joined teachers in seeking higher salaries outside Zimbabwe. Mudonhi expressed appreciation for United Methodist Volunteers in Mission teams. A team from South Carolina pooled their money to help paint hospital walls and purchase new mattresses, and a South Carolina congregation is supporting a water project. "We are struggling, but we are making it through, and we are surviving," said Mudonhi. "We are dealing with necessities only." He pointed to the cracks in his office wall and explained that fixing them is now a luxury. Then he asked, "So where are we heading to? People are bleeding inside, but outside it appears things are going on well." 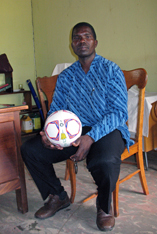 Asked if he has hope, Mudonhi bounced a soccer ball on the cement floor and said, "This is what gives me hope. Once we touch the ground, we will bounce back. I don’t know how, though." 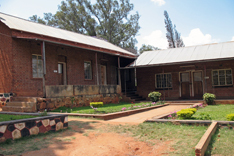 Old Mutare Hospital––Accommodations for additional staff, revitalization of the existing hospital, an ambulance and an outreach vehicle, office equipment, hospital equipment, medical supplies. Donations to the mission can be placed in local church offering plates or sent directly to the Advance at P.O. Box 9068, GPO, New York, NY 10087-9068. Designate checks for Global Hospital Revitalization: Advance #982168 and specify “Old Mutare.” Donations also can be sent to Old Mutare Mission Hospital, Ambulance, Advance #13860S-Africa, Zimbabwe; the Old Mutare Mission Hospital, Autoclave (sterilization) Machine, Advance #13861O-Africa, Zimbabwe; and the Babyfold at Old Mutare Hospital, Advance #11713T-Africa, Zimbabwe, Mutare. Credit card donations can be made by calling (888) 252-6174. More information about The Advance for Christ and His Church and how to give is available at http://new.gbgm-umc.org/about/advance/. Contact Mudonhi by e-mail at mudonhis@africau.ac.zw. *Rice is a freelance writer based in Nashville, Tenn.
News media contact: Linda Green, Nashville, Tenn., (615) 742-5470 or newsdesk@umcom.org.